This is Julio. He is the newest foster turned into Southern Reptile Saviors Rescue Inc. As you can see he is missing part of his lower jaw. His previous owner said when he was smaller he had mouth rot and an abscess that had to be removed, along with part of the jaw bone. Mom says it makes him look cute. It takes him a bit longer to eat than the rest of the iguanas. Occasionally, he needs his top jaw cleaned of old food. But the good thing – he can’t bite! He thinks he can, he tried to bite Stumpy, but he ended up hurting his upper jaw more than he hurt Stumpy. He likes to free roam and he loves to sit in a window. Right now he is in jail in a cage because he tried to bite Stumpy. There are way too many males around here that are in breeding season! Since I’m still recovering from my surgery, I haven’t really met him yet. But you know me, I don’t want any other males in my house around my Wilma! Julio has a lot of fans on Facebook but so far he hasn’t found a family close enough to adopt him. Hopefully he will soon! His last owner said he likes to hang out on the couch. 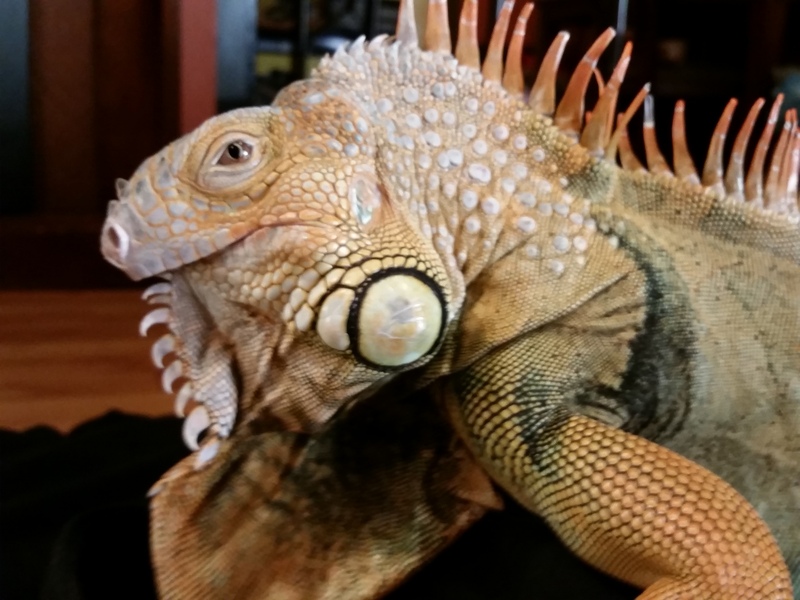 Mom thinks if he got into a house without all these other iguanas, he would make someone a really great pet.